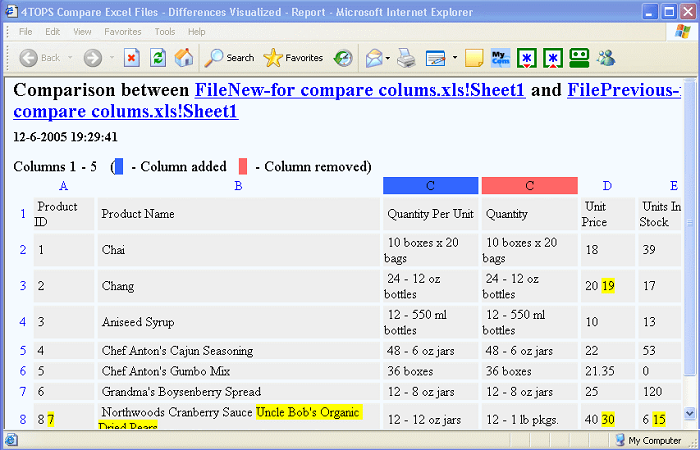 4TOPS Compare Spreadsheets: Find differences between Excel files intelligently. Use 4TOPS Mail Merge for Microsoft Access to create both simple and complex documents: personalised emails, letters, quotations, invoices, contracts, surveys, reports and audits, well integrated with your Access application. Create Microsoft Word, Microsoft Excel, email, PDF documents. 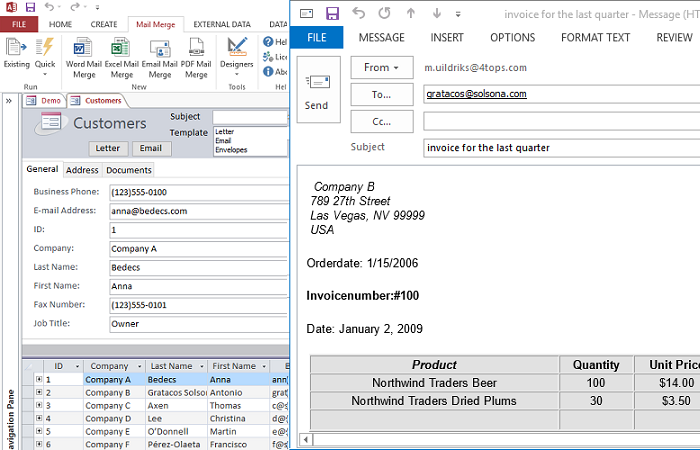 Mail Merge for Microsoft Access is used by both Access users and by professional Access developers. 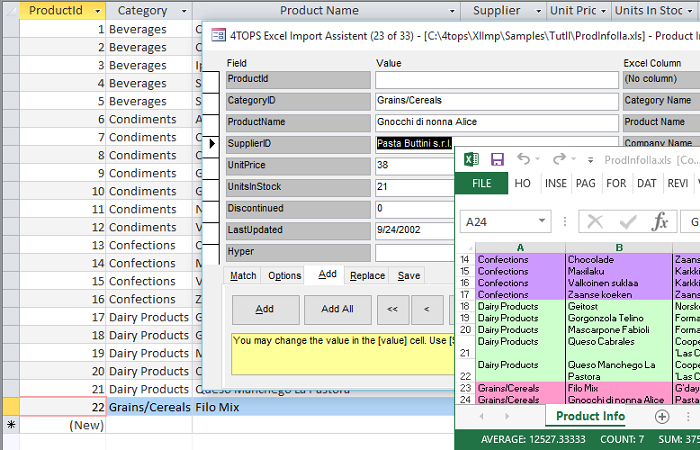 4TOPS Excel Import Assistant is an add-in for Microsoft Access for importing Microsoft Excel into Microsoft Access in a controlled way. Instead of entering data one by one from a spreadsheet or another source that can be converted into a spreadsheet, the users simply need to import data, thus saving enormous amount of time and money on data entry. The wizard is typically used in situations such as a new Microsoft Access system where data needs to be moved from Microsoft Excel to Microsoft Access or for regularly importing files from outside sources or from another system. 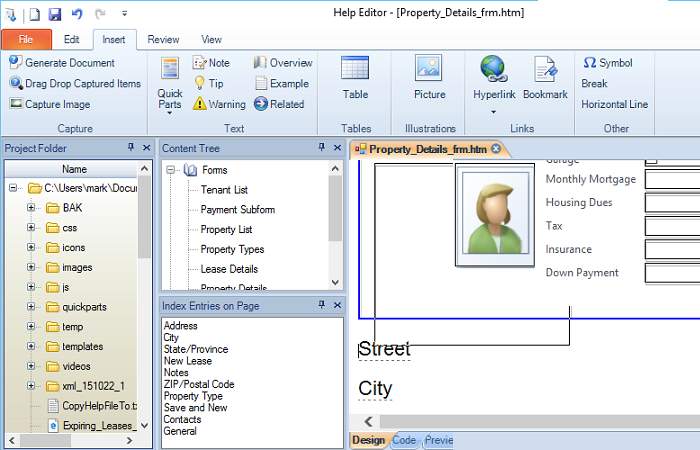 Code VBA is an add-in for both professional software developers and MS Office users of Visual Basic for Applications. 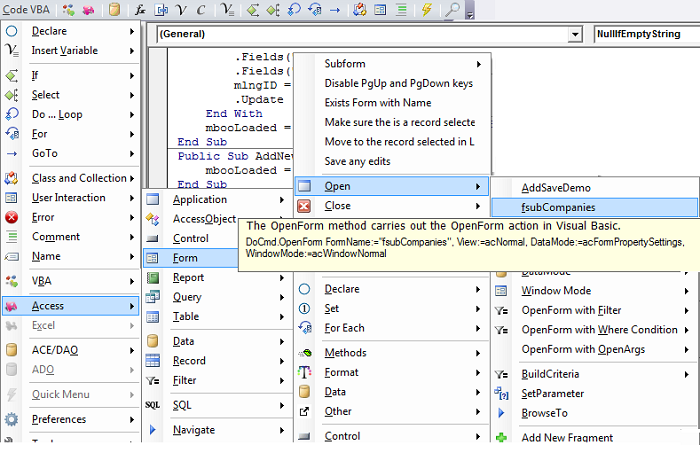 Using Code VBA you will write VBA code faster and spend less time looking for solutions on-line. Insert complete blocks of code declarations, program structures (if, select, loops), procedure calls and variables using code builders. The Code Explorer lets you move to the relevant procedures easily and adds new features such as comment code and tidy the code indentation. 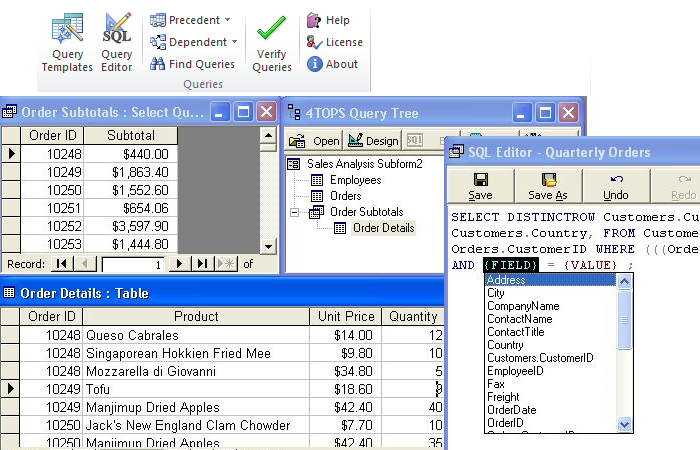 Improve your Microsoft Access query development by using the tools of the 4TOPS Query Tree Editor add-in. Query Tree reduces the analysis time in the cases a query doesn't give the result you want. As an Access developer it can be a real pain to figure out all of the related queries when trying to make modifications to your database. Just touching one query may break a number of areas. This tool helps figure all that out. The best way to make documentation available with your Microsoft Access application is by adding a help file. By pressing F1 or the Help button the user immediately gets the info he is looking for. The Help Generator for Microsoft Access greatly simplifies making help files and user documentation. No special help authoring expertise is needed to create help files. The Help Generator not only lets you make the online Help, but also user and technical documentation in Microsoft Word. 4TOPS Compare Spreadsheets using Microsoft Excel makes it easy to find the differences between spreadsheets, workbooks and selected ranges. It generates difference reports in HTML and color highlights the different cells showing what was added, removed or changed. The Excel compare tool supports all formats that can be opened in Excel, including OpenOffice ods.